J.C. Penney might turn its ship around, but Sears is clearly capsized. J.C. Penney (NYSE:JCP) is often mentioned in the same breath as Sears Holdings (NASDAQOTH:SHLDQ). On the surface, there are similarities -- both retailers flourished in past decades, but the rise of e-tailers and sluggish mall traffic gutted their businesses. As a result, both stocks plummeted by more than 90% over the past decade and now trade at very low valuations. J.C. Penney trades at just 0.1 times sales, and Sears has a price-to-sales ratio of 0.05 -- compared with the industry average of 0.3 for department stores. Value investors might look at Sears' lower price-to-sales ratio and assume that it's the cheaper stock. However, investors should always spot the differences between a "cheap" stock and a doomed one. If we compare J.C. Penney and Sears' core businesses, we'll see that J.C. Penney is the better value play for four simple reasons. J.C. Penney's annual revenue rose 3% in fiscal 2014 and another 3% in 2015, and it dipped less than 1% in 2016. Analysts expect its revenue to slip 3% this year and another 1% next year. Those numbers look mediocre, but they easily beat Sears' sales declines of 14% in 2014, 19% in 2015, and 12% in 2016. J.C. Penney's comps were merely flat in 2016, while Sears' combined comps (including Sears and Kmart) tumbled more than 7%. J.C. Penney's bottom-line growth is also superior to Sears'. J.C. Penney posted net losses for several straight years, but it squeezed out a slim non-GAAP profit of $0.08 per share in 2016. Wall Street expects J.C. Penney to remain profitable for the next two years. Sears, however, remains deeply unprofitable, and its losses are expected to widen over the next two years. Under CEO Eddie Lampert, who took over in 2013, Sears aggressively closed stores to stay afloat. Between fiscal 2012 and 2016, Sears reduced its total store count by 44% to 1,430 locations. During that same period, J.C. Penney reduced its store count by just 8% to 1,013 locations. In other words, Sears is burning the furniture to stay warm. But the more furniture it burns, the less relevant its brand becomes -- as we saw with the collapse of its former rival Montgomery Ward. To make matters worse, all those store closures aren't boosting Sears' profits. J.C. Penney is implementing a wide range of turnaround strategies under CEO Marvin Ellison, who took the helm in 2015. J.C. Penney improved the product presentation at its stores, brought back appliances in a bid to steal Sears' customers, boosted its supply-chain efficiency, and expanded its in-store salons. It also expanded its home-improvement department, increased its athletic apparel and plus-size offerings, added new toy shops, and expanded its Sephora in-store locations. It upgraded its website and enhanced its analytics capabilities to better understand what shoppers wanted, and it launched a new B2B program for selling furnishings to hotels. The bears argue that J.C. Penney's scattergun strategy is unfocused, but it's easier to understand than Sears' vague turnaround plans -- which mostly consist of closing more stores, laying off employees, unloading its real estate, and selling off its brands, including Craftsman. Sears claims that expanding its loyalty programs will win back customers, but that could be tough as it shrinks its brick-and-mortar footprint. 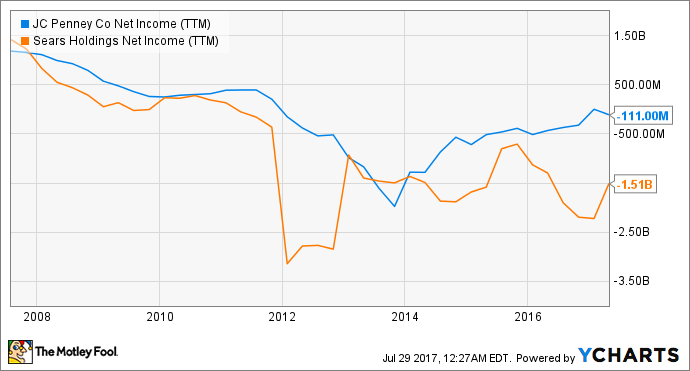 Both retailers are shouldering a lot of debt. But J.C. Penney's debt load is decreasing -- its total long-term debt dropped 7% annually to $4.1 billion last quarter. Sears' total long-term debt, however, rose 9% to $3.7 billion last quarter. Some analysts are worried that Sears can't tread water for much longer. Its cash and equivalents fell 17% annually to just $236 million last quarter, and it had a negative free cash flow of $1.6 billion over the past 12 months. J.C. Penney's cash and equivalents slid 13% annually to $363 million last quarter, but its negative free cash flow of $89 million during the past 12 months looks much more manageable. 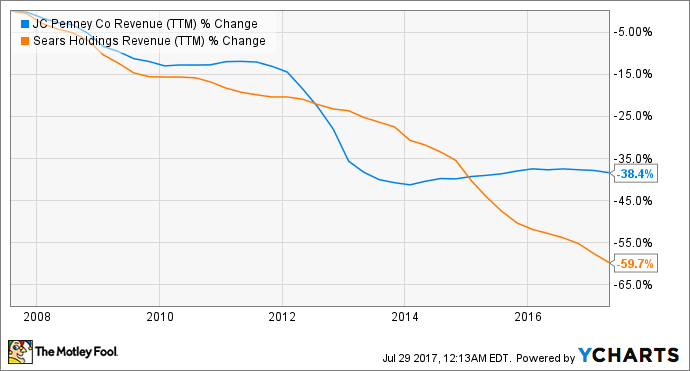 But should you actually buy J.C. Penney? J.C. Penney is clearly a better value play than Sears, but it's still a risky investment. The best-case scenario for J.C. Penney is that it strikes the right balance between its e-commerce and brick-and-mortar stores, occupies the right niches (such as home improvement) that are defensible against e-tailers, and wipes out struggling rivals such as Sears. If it can pull that off, it could be a great bargain at current prices. But if just one of those strategies comes up short, it could have a lot more room to fall.